Good Evening and a warm welcome to Rashtrapati Bhavan! 1.Let me begin by congratulating the winners of the Visitor’s Awards, 2016 – Tezpur University in the category of Best University; and the scientists from Jawaharlal Nehru University in both research and innovation. These Awards are a recognition of your years of sincere effort and hard work. 2.Education, research and innovation are the three crucial pillars for achieving higher growth and sustained progress. Countries that have created strong networks amongst higher educational institutions and with other key stakeholders like industry and research bodies have experienced rapid innovation, product development and industrialization. In the process, it has led to generation of knowledge, wealth and welfare for the people. 3.Keeping in view the importance of higher education, research and innovation, I had announced the institution of the Annual Visitor’s Awards in 2014. My Secretariat was quick to process the implementation of the Awards, and in 2015, the first Awards were given. Today, I am happy to confer the second Visitor’s Awards to the worthy recipients in three categories. 4.Tezpur University confirms my conviction that the higher education landscape in the north-eastern region is not only brimming with potential but is now realizing it too. I have had the good fortune to visit a few institutes of higher learning in this region. And I can say with confidence that the more we harness the creativity of the North-East, the greater the benefit that we will be able to derive for the development of this region and the country. I congratulate the leadership of Tezpur University for their accomplishment and wish to see it achieve even greater heights in future. 5.The Awards for both Research and Innovation to the scientists of JNU is an indication of the depth of innovation, research and collaboration in this prestigious university. I compliment the members of the award-winning teams for their excellent work and wish them continued success and progress in their areas of research and innovation. 6.When I assumed this Office as the thirteenth President of India, I also became the Visitor to over one hundred central institutions of higher learning. I took some time to understand the role of the President as the Visitor. I also took time to grasp the status of higher education in our country. I found not a single Indian institution in the top 200 global rankings despite the potential that many institutions exhibited. It was the lack of focus and the absence of a methodological approach that denied this distinction to any of our institutions. 7.My constant exhortation and persistence has now started bearing fruits. Good results have started to come in. Two Indian institutions figure for the first time in the list of the top 200 universities in the world published by one renowned international rating agency. In the ranking of small universities made by another reputed international agency, IIT Guwahati has been placed at the twelfth position. This is a unique achievement and should inspire all our institutions including those that have been set up in recent years. 8.To be a top higher educational institution requires one to adhere to a few basic pre-conditions. To my mind, the most critical amongst them are ensuring the quality of education and research, enhancing faculty standards, and establishing collaborations / linkages with international as well as domestic organizations. The emphasis on academic excellence, as well as inculcating core civilizational values of patriotism, compassion, honesty, tolerance, performance of duty and respect for women - has to be maintained all through. 9.Research is important from the standpoint of knowledge creation as well as wider social applicability. ‘Greater good for greater number of people’ has to be the driving force behind research in our institutions. A determining parameter to guide our research priorities is the degree of its relevance to society. Likewise, innovation activity has to be geared towards the welfare of the common man. Innovations have to simplify lives, provide relief to the burdened, and offer means of enterprise to the entrepreneurial and the industrious. The Visitor’s Awards presented today in the three categories of Best University, Best Research and Best Innovation conform to this philosophy. 10. 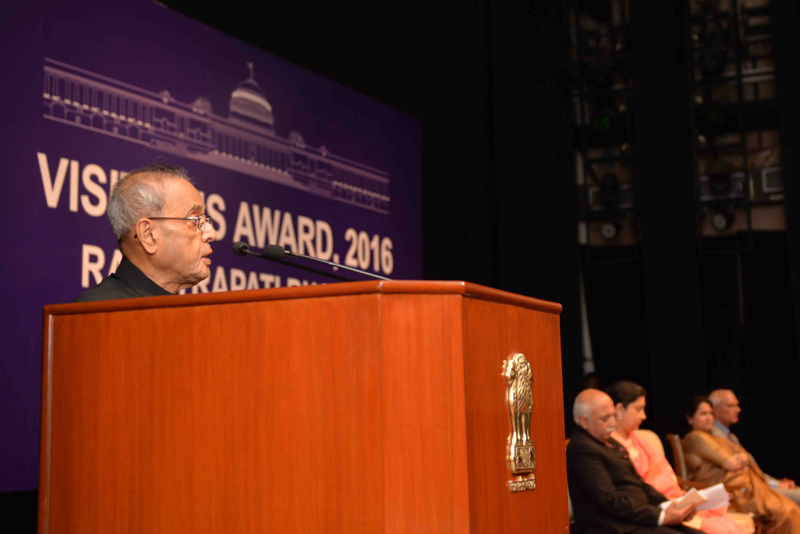 These Awards should inspire and motivate the central universities and their academic communities to excel further. You all must work towards becoming temples of knowledge and learning. I wish you Godspeed in your endeavours.